Strange creatures have been showing up in the sewers, and the Mario Bros. have been sent to clear up them up. 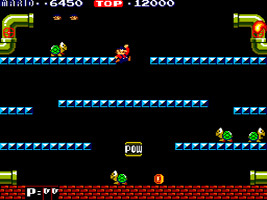 Enemies walk out of the pipes at the top of the screen and drop down across the platforms to the bottom, where they enter the pipes and reappear at the top. You have to knock them over by hitting the platform they are standing on from underneath, then finish them off by kicking them. Either play alone as Mario, or team up with a second player as Luigi. Together you can cooperate to clear the Phases or compete for Coins and bonus points. A portly plumber who has to clear the sewers of critters. Mario has to knock them over by hitting the platform they are standing on, then jump up and kick them off the screen. Mario's brother Luigi joins him in the 2-Player game. The two must work together to clear the sewers, while competing for Coins and bonus points. A low-slung turtle. If Mario of Luigi hit the platform it is standing on, it falls onto its back. If it isn't kicked off the screen quickly, it will right itself and move faster. A scuttling crab. If Mario or Luigi hit the platform it is standing on, it gets mad and starts moving much faster. Hit the floor beneath it a second time to knock it over. A hopping fly. Because it's always jumping around, Mario and Luigi can only knock it over when it is touching the floor. A sliding ice creature. When Slipice stops moving, it covers the platform it is on with ice, making it extremely slippery. A red fireball that appears when the critters reach the bottom of the screen. It bounces around slowly, getting in the way. The green fireball appears at the sides of the screen when you take too long to clear a stage. It moves across the stage then disappears. Every time you knock an enemy off the screen, a Coin appears from a pipe. Grab the Coin before it disappears through the pipes for bonus points. Hit the POW Block to make everything standing on the ground flip over. You can only hit the POW Block three times, then it disappears until the next Bonus Stage.